It is 51 years to the day since poet and novelist, Sylvia Plath, took her own life. As has often been the case, the suicide or accidental death of an artist has spawned – in Sylvia’s case – decades’ worth of speculation as to the why and wherefore of art and death. It has been curious to watch the media speculation about the recent death of Phillip Seymour Hoffman recently. It does not appear that we have grown bored with the sadness and misfortune of others. Despite having spent several months (or is it years?) considering the life and work of Ms Plath in the development of this work with Thomas Day, it is almost galling to me how little interest I really do have in her death. What’s wrong with me? Surely that’s the kicker? 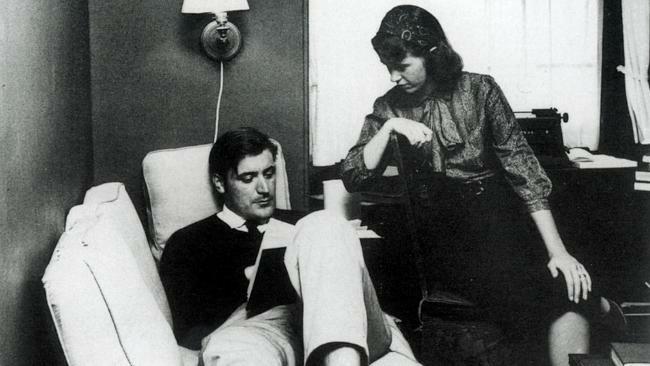 I’m five years older than Plath was at the time of her death, and more than five decades later, I remain interested in her work, aware of her personal circumstances, and conscious of the deeply personal overlay that I have applied to those two things. Again, seeing the world as I am, not really so much as it is. But I can’t really say it’s all about that single fulcrum of her suicide. I just want to read the poetry. Tonight is the last time that Thomas and I will perform our work, DJ Thought Fox vs MC Lady Lazarus, which is an audio-visual and poetic response to the works and lives of poets Sylvia Plath and Ted Hughes. Details and a link to the event page are below. Together, we have shared this work in Canberra, Sydney, Brisbane and Hobart, in festivals such as the Queensland Poetry, Art Not Apart, Brisbane Fringe and Tasmania Poetry festivals. It has been a thrill and a delight – and a profound challenge. Firstly, it’s daunting to approach writers like Plath and Hughes and presumptuous to think you’ve got anything sensible to say about them. Add to this the fact that your collaborator is talented and capable, more so than you in many ways. And you’re hardly working with a blank slate – your audiences seem to know more about Sylvia and Ted than you do, and you’ve spent ages reading super boring biographies and still haven’t anything clever to say. After all of which, you return to their work. Both poets are strong, capable writers and the stories contained within these poems remind you of why you liked reading poetry, life stripped all the way down to the bone, the whitened, calcified remains of existence typed so humbly on a page. You might even change teams and like Ted after all. Or just his work? Surely, it’s all about the work. But then, why are you bothering to explain it all? Why you wanted to know these things? How you tried to come close and still failed. How deeply you longed for this and how profoundly it didn’t work out. Sylvia always said it better. You have never once been so acutely alive.